[Price,SwapRate,AI,RecCF,RecCFDates,PayCF,PayCFDates] = swapbyzero(RateSpec,LegRate,Settle,Maturity) prices a swap instrument. You can use swapbyzero to compute prices of vanilla swaps, amortizing swaps, and forward swaps. All inputs are either scalars or NINST-by-1 vectors unless otherwise specified. Any date can be a serial date number or date character vector. An optional argument can be passed as an empty matrix . [Price,SwapRate,AI,RecCF,RecCFDates,PayCF,PayCFDates] = swapbyzero(RateSpec,LegRate,Settle,Maturity,Name,Value) prices a swap instrument with additional options specified by one or more Name,Value pair arguments. You can use swapbyzero to compute prices of vanilla swaps, amortizing swaps, forward swaps, and cross-currency swaps. For more information on the name-value pairs for vanilla swaps, amortizing swaps, and forward swaps, see Vanilla Swaps, Amortizing Swaps, Forward Swaps. Specifically, you can use name-value pairs for FXRate, ExchangeInitialPrincipal, and ExchangeMaturityPrincipal to compute the price for cross-currency swaps. For more information on the name-value pairs for cross-currency swaps, see Cross-Currency Swaps. Load the file deriv.mat, which provides ZeroRateSpec, the interest-rate term structure needed to price the bond. Use swapbyzero to compute the price of the swap. In swapbyzero , if Settle is not on a reset date (and 'StartDate' is not specified), the effective date is assumed to be the previous reset date before Settle in order to compute the accrued interest and dirty price. In this example, the effective date is ( '15-Sep-2009' ), which is the previous reset date before the ( '08-Jun-2010' ) Settle date. Create the RateSpec using intenvset. Look at the Rates for the two interest-rate curves. Price three swaps using two curves. Price three swaps using the two curves. To compute a forward par swap rate, set the StartDate parameter to a future date and set the fixed coupon rate in the LegRate input to NaN. Define the zero curve data and build a zero curve using IRDataCurve. Create a RateSpec structure using the toRateSpec method. Compute the forward swap rate (the coupon rate for the fixed leg), such that the forward swap price at time = 0 is zero. The forward swap starts in a month (1-Feb-2012) and matures in 10 years (1-Feb-2022). The swapbyzero function generates the cash flow dates based on the Settle and Maturity dates, while using the Maturity date as the "anchor" date from which to count backwards in regular intervals. By default, swapbyzero does not distinguish non-business days from business days. To make swapbyzero move non-business days to the following business days, you can you can set the optional name-value input argument BusinessDayConvention with a value of follow. To demonstrate the optional input BusinessDayConvention, swapbyzero is first used without and then with the optional name-value input argument BusinessDayConvention. Notice that when using BusinessDayConvention, all days are business days. Compute the price of a forward swap that starts in a year (Jan 1, 2013) and matures in three years with a forward swap rate of 4.27%. If Settle is not on a reset date of a floating-rate note, swapbyzero attempts to obtain the latest floating rate before Settle from RateSpec or the LatestFloatingRate parameter. When the reset date for this rate is out of the range of RateSpec (and LatestFloatingRate is not specified), swapbyzero fails to obtain the rate for that date and generates an error. This example shows how to use the LatestFloatingRate input parameter to avoid the error. Create the error condition when a swap instrument’s StartDate cannot be determined from the RateSpec. The rate at the instrument starting date cannot be obtained from RateSpec. Its reset date (01-Dec-1999) is out of the range of dates contained in RateSpec. This rate is required to calculate cash flows at the instrument starting date. Consider specifying this rate with the 'LatestFloatingRate' input parameter. Here, the reset date for the rate at Settle was 01-Dec-1999, which was earlier than the valuation date of ZeroRateSpec (01-Jan-2000). This error can be avoided by specifying the rate at the swap instrument’s starting date using the LatestFloatingRate input parameter. Define LatestFloatingRate and calculate the floating-rate price. Define the OIS and Libor rates. 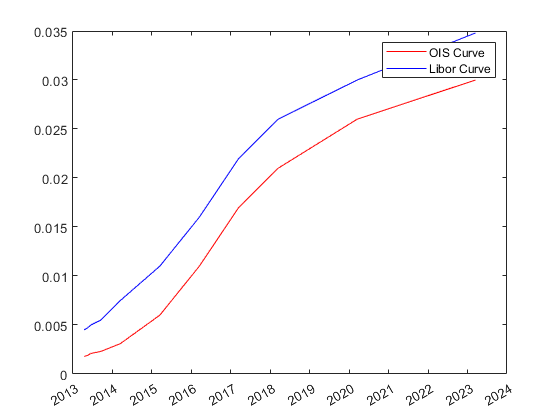 Create an associated RateSpec for the OIS and Libor curves. Compute the price of the swap instrument. The LiborCurve term structure will be used to generate the cash flows of the floating leg. The OISCurve term structure will be used for discounting the cash flows. Compare results when the term structure OISCurve is used both for discounting and also generating the cash flows of the floating leg. Price an existing cross currency swap that receives a fixed rate of JPY and pays a fixed rate of USD at an annual frequency. Price a new swap where you pay a EUR float and receive a USD float. Interest-rate structure, specified using intenvset to create a RateSpec. RateSpec can also be a 1-by-2 input variable of RateSpecs, with the second RateSpec structure containing one or more discount curves for the paying leg. If only one RateSpec structure is specified, then this RateSpec is used to discount both legs. Settlement date, specified either as a scalar or NINST-by-1 vector of serial date numbers or date character vectors of the same value which represent the settlement date for each swap. Settle must be earlier than Maturity. Dates when the swaps actually start, specified as the comma-separated pair consisting of 'StartDate' and a NINST-by-1 vector of serial date numbers, character vectors, or cell array of character vectors. Rate for the next floating payment, set at the last reset date, specified as the comma-separated pair consisting of 'LatestFloatingRate' and a scalar numeric value. LatestFloatingRate accepts a Rate for the next floating payment, set at the last reset date. LatestFloatingRate is a NINST-by-1 (or NINST-by-2 if LatestFloatingRate is different for each leg). Rate curve used in generating cash flows for the floating leg of the swap, specified as the comma-separated pair consisting of 'ProjectionCurve' and a RateSpec. If specifying a fixed-float or a float-fixed swap, the ProjectionCurve rate curve is used in generating cash flows for the floating leg of the swap. This structure must be created using intenvset. If specifying a fixed-fixed or a float-float swap, then ProjectionCurve is NINST-by-2 vector because each floating leg could have a different projection curve. Foreign exchange (FX) rate applied to cash flows, specified as the comma-separated pair consisting of 'FXRate' and a NINST-by-2 array of doubles. Since the foreign exchange rate could be applied to either the payer or receiver leg, there are 2 columns in the input array and you must specify which leg has the foreign currency. Flag to indicate if initial Principal is exchanged, specified as the comma-separated pair consisting of 'ExchangeInitialPrincipal' and a NINST-by-1 array of logicals. Flag to indicate if Principal is exchanged at Maturity, specified as the comma-separated pair consisting of 'ExchangeMaturityPrincipal' and a NINST-by-1 array of logicals. While in practice most single currency swaps do not exchange principal at maturity, the default is true to maintain backward compatibility. Swap prices, returned as the number of instruments (NINST) by number of curves (NUMCURVES) matrix. Each column arises from one of the zero curves. Price output is the dirty price. To compute the clean price, subtract the accrued interest (AI) from the dirty price. Rates applicable to the fixed leg, returned as a NINST-by-NUMCURVES matrix of rates applicable to the fixed leg such that the swaps’ values are zero at time 0. This rate is used in calculating the swaps’ prices when the rate specified for the fixed leg in LegRate is NaN. The SwapRate output is padded with NaN for those instruments in which CouponRate is not set to NaN. Accrued interest, returned as a NINST-by-NUMCURVES matrix. Cash flows for the receiving leg, returned as a NINST-by-NUMCURVES matrix. If there is more than one curve specified in the RateSpec input, then the first NCURVES row corresponds to the first swap, the second NCURVES row correspond to the second swap, and so on. Payment dates for the receiving leg, returned as an NINST-by-NUMCURVES matrix. Cash flows for the paying leg, returned as an NINST-by-NUMCURVES matrix. Payment dates for the paying leg, returned as an NINST-by-NUMCURVES matrix. Swaps where the payment legs of the swap are denominated in different currencies. 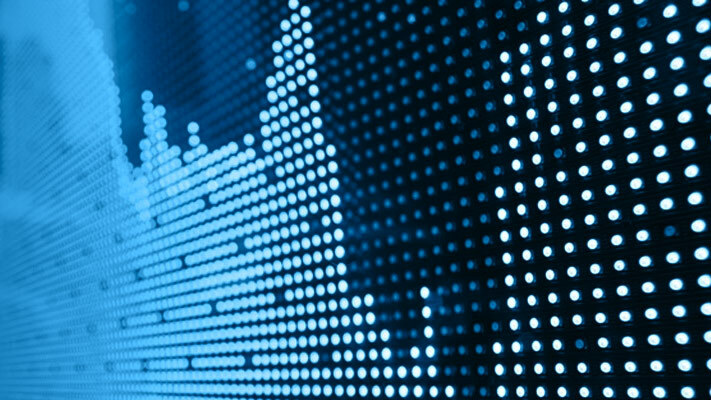 One difference between cross-currency swaps and standard swaps is that an exchange of principal may occur at the beginning and/or end of the swap. The exchange of initial principal will only come into play in pricing a cross-currency swap at inception (in other words, pricing an existing cross-currency swap will occur after this cash flow has happened). Furthermore, these exchanges of principal typically do not affect the value of the swap (since the principal values of the two legs are chosen based on the currency exchange rate) but affect the cash flows for each leg. Hull, J. Options, Futures and Other Derivatives Fourth Edition. Prentice Hall, 2000.